General updates on Straight Shooter or the firearms industry in general. Today, I received my Maryland Qualified Handgun Instructor certificate from the Maryland State Police. 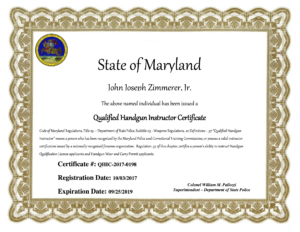 I can officially offer courses that satisfy the Maryland Handgun Qualification License (HQL) and Wear and Carry Permit (CCW) training requirements. Please see our Basic Pistol (HQL) and our Personal Protection (CCW) courses for more info.